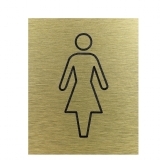 Ladies, Gents, Accessible toilet signs made to order in a variety of plastics and metals. Traditional or more modern quirky style pictograms available and we can custom make to your own design. We also supply toilet signs with wording in a variety of fonts and colours.